If you’re having a milestone birthday, why not celebrate in style with live music? We’ve provided a great variety of live music acts for 50th birthday celebrations over the years. It’s always a pleasure to see how happy and fun these occasions are, as well as helping to create a brilliant atmosphere on the day. With the variety of acts we have available, we’re sure to be able to match music to your particular event. The host of this most recent party, Kandice decided on a formal black tie theme and so set the tone of the evening. 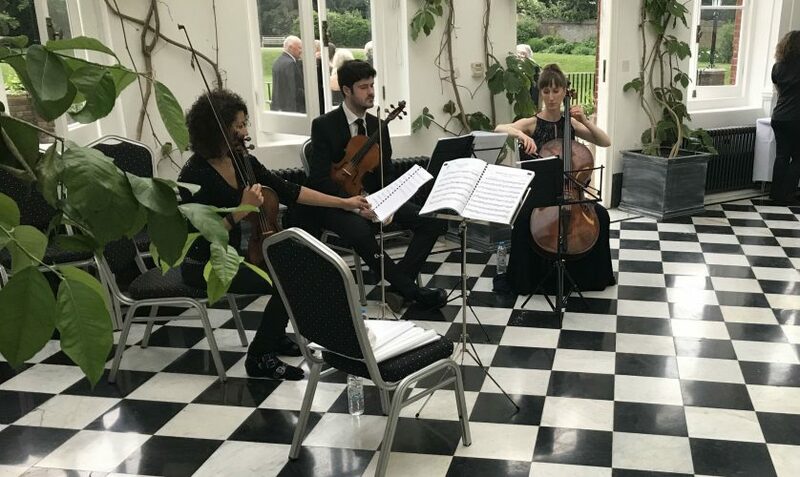 The party was held at York House with our string quartet playing for the first hour and a half, as everyone arrived and drank champagne on the terrace. In order not to make it too formal, we started with more classical numbers and then moved on to some light jazz. Finally for our last set we played a selection of pop music as the atmosphere became more lively, shortly before dinner was served. A DJ then provided the music to dance to after the dinner. Setting the tone for the evening is an excellent idea and live music is such a perfect way to do so. As guests arrive it’s a great ice-breaker and lifts the occasion immediately. Another recent 50th birthday party we provided music for was again well-planned and thought out by our client Téa. She decided on a less formal party at home and in her garden (with a back up inside the house – always an essential option for a UK event as you can never be sure of the weather!). In this case, the summer weather was perfect as it has been this year more than usual. She hired someone to do a cocktail making class with the guests. As an aside to music, we think that this is a great idea for a party in general. A relaxed masterclass by an expert is a lovely talking point and something interactive that your guests can really have fun with. Téa told us she wanted a jazz act, so we recommended a jazz clarinet trio playing swing music. This is the perfect act as it creates a good party atmosphere and it definitely fits a garden party setting. The combination of this kind of toe tapping music and cocktails is a great one, so the fit worked really well. Afterwards Téa let us know that the music was really enjoyed by all her guests and helped make the party – music to our ears! Steve wanted something a bit different for his 50th dinner party. He’d always loved gospel music and so hired our 16 piece gospel choir to sing a few tunes between the main course and desert. The choir blew everyone away with their joyful singing and exuberant performance. It was a great touch as it perfectly expressed music that he loved (and it being his 50th, it was a really special occasion for him and his guests). This act worked really well as it could be enjoyed by all his friends and family, regardless of their musical tastes. He went for a crowd pleaser and it went brilliantly! Although live music is sometimes overlooked for the cheap alternative of a playlist on some speakers, we often get great feedback for the music we provide at events and parties. Words and phrases like ‘atmosphere’, ‘set the tone’, ‘lifted the party’ and others are frequently mentioned. With a live band, singer, or other musical group there is something much more special and entertaining. You can also watch the music being played and the sound has that wonderful spontaneous quality that pre-recorded music simply doesn’t. Turning 50 is a great milestone. If you’re going to throw a party, throw one with real live music! It can really help make the event and we can advise on the best act to chose from. So do get in touch with us if you are planning a 50th or any other special occasion. We’d love to hear from you.